From the Baldwin County Courthouse, go east on Hancock St. and follow Highways 22/24 southeast for 4.4 miles to the split of Highways 22 and 24. Bear right on Highway 24 and go for 2.1 miles to Medlin Road. Turn right on Medlin. Go 900 feet to driveway on the right side of Medlin Rd. 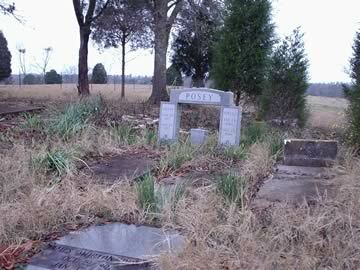 The cemetery is located 1000 ft. from Medlin Road down the drive and behind the old Posey-Medlin homeplace. 4 graves. It is believed these graves are not part of the Posey-Medlin family.